Protected by a high-performance polyaspartic coating system, this newly coated concrete floor can withstand the constant impact of 25-ton fire trucks. Yellow striping was incorporated into the coating to delineate vehicle parking. Because the striping is a colored polyaspartic protected by a clear topcoat, it should never need reapplicaton. A close-up of the floor shows the decorative vinyl chips broadcast into the surface, resulting in a terrazzo-like finish. Regular pressure washing is the only maintenance required. Serving over 3,000 residents and responding to more than 500 emergency calls a year, the Wellington Fire Protection District in Wellington, Colo., needs to be ready for action at all times. So when the district recently completed construction of a new firehouse, they needed a concrete floor coating system that would be fast to install and require minimal downtime for maintenance. The coating also had to be able to withstand the impact of heavy truck traffic as well as exposure to oil, grease and harsh chemicals. After consulting with the fire district, the decision was made to install HP Spartacote’s Sparta-Chip, a high-performance polyaspartic coating that met all of the firehouse’s requirements. “This coating system offers a rapid return-to-service, excellent abrasion resistance and gloss retention, superior durability and high-solids content,” says Nanninga. It also gives floors a terrazzo-like seamless flooring finish, enhanced by decorative vinyl chips that are broadcast into the surface. 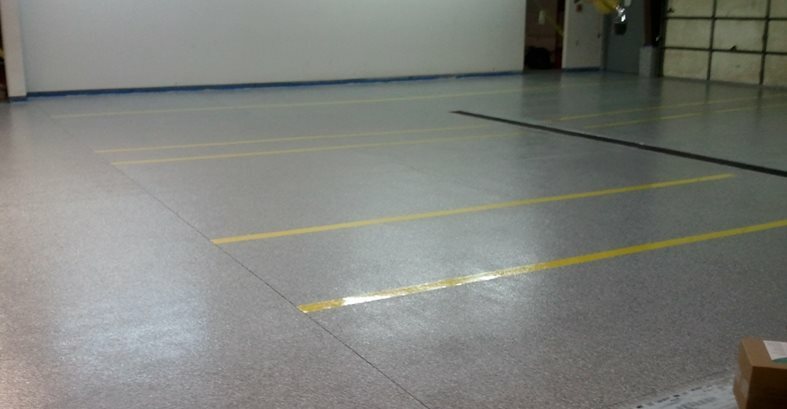 Before installing the coating, Mile High conducted moisture vapor tests on the newly poured concrete floor and then prepped the surface using a grinder equipped with 50 grit medium-bond diamonds to ensure optimal coating adhesion. 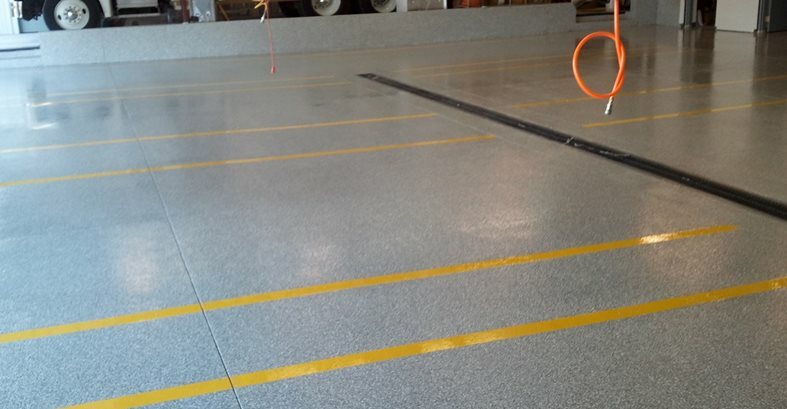 After prepping the floor, the crew installed a prime coat of light-gray Sparta-Flex polyaspartic coating. 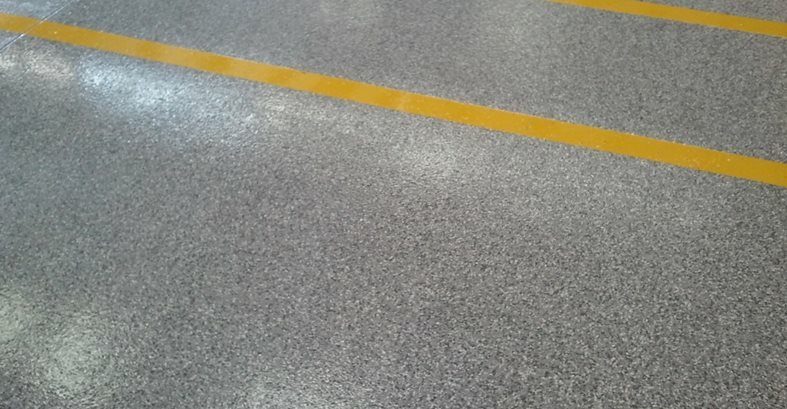 To facilitate vehicle parking, the firehouse also asked Nanninga to integrate 12 40-foot-long yellow stripes into the floor. “We chose a durable, reflective yellow stripe and applied a clear coat over the top to protect the striping,” he says. After installing the base coats, the crew broadcast the Sparta-Chip vinyl chips over the surface followed by the application of a high-gloss topcoat that would resist hot tire marks, chemicals and abrasion. Because the Spartacote system cures rapidly, the floor was put back into service the next day. The firehouse crew can now focus on saving lives rather than maintaining their floors. “The floor is simple to clean. The station regularly pressure washes the floor and does not need to use any special cleaner. The life expectancy of the floor should be at least 15 years. The nice thing is that repairs, if needed, are simple. Long-term maintenance might include a re-application of the clear coat,” says Nanninga. Project location: Wellington Fire Protection District, Wellington, Colo.